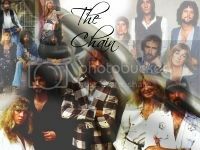 On the 39th anniversary of Fleetwood Mac Day, and the 23rd anniversary of the release of “Time,” the last official Fleetwood Mac album to feature Christine McVie, I will be seeing the newest version of Fleetwood Mac for the first time in Louisville!!! I was able to get a nosebleed seat for just under $60 all in. I hope you rocked and I hope you rolled, you old man. Did you buy me a T-shirt? I did all of the above and got a hat. So...how did it go? Did you have any thoughts to share? SteveMacD, is it true you're seeing Lindsey in Canton? And please tell us about the FM show. From the videos I’ve seen they were awesome and Stevie was on her game! Sounded better than she has for years. Overall, it was a fantastic show. There was plenty of chemistry and energy. It wasn’t the same, but that’s not necessarily a bad thing. It had it’s own vibe. They especially seemed to be having a good time with how to pronounce "Louisville," especially with all the different accents. Christine might not have much of her voice left, but the essence is still there, and it’s not bad for a 75 year old. I’d rather have Christine back, even somewhat diminished, than not have her there. Her solos and interplay with Mike on BMW and TMATTYD were probably my favorite moments of the show. It’s awesome seeing the band tap into something that’s largely been dormant since Rick Vito’s take on “Stop Messin’ Round” in 1990. For all the crap she’s getting (a lot of it rightly deserved), Stevie has become the big cheerleader for the band. She seemed much, much more engaged with the band and the crowd than the last few times I’ve seen Fleetwood Mac. Her voice seemed a little better than the last Fleetwood Mac tour. Her strongest performance was Free Fallin', especially at the end. Neil and Mike are fantastic. They both stay true to the original spirit of the songs while putting their own mark on the sound, Mike maybe more so than Neil. But their energy and chemistry with the others was very apparent. The only song I missed Lindsey on was “Landslide.” Not that I have an objection to them playing it, and Neil and Neale did a great job that was truer to the 1975 album version, but Lindsey’s 1997 rearrangement took the song to a different level. I also wish they would cut either Monday Morning or Second Hand News in favor of another Danny Kirwan or Bob Welch song. Last edited by SteveMacD : 10-12-2018 at 01:50 PM. I bet Neil songs Monday Morning and Second Hand News because he likes those songs. I'm sure he could have sang Blue Letter or Man of the World, but he enjoyed singing the other 2 a little more. I'm glad FM isn't acting like Lindsey didn't exist. Some random observations after I watched this. How little eye makeup Stevie is wearing. How little interaction there is with Neil Finn. Avoiding no Lindsey there? Stevie always nails this song. The audience loves it. It is a classic. Vanessa Carlton's daughter is Sidney!